rules | Are We There Yet? This past weekend, my older daughter had a party for her 9th birthday. The guest list was a core group of four boys whose friendship dates back to preschool and kindergarten. And her six year old sister. The party was at Northern Lights Rock & Ice — an outdoor climbing, challenge, adventure site. 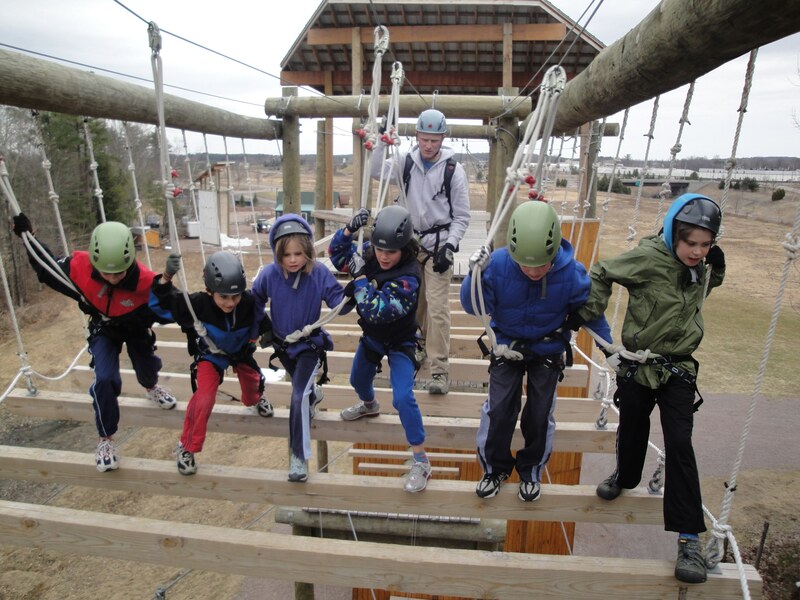 The kids had a blast crossing a ropes course that was about 50 feet in the air. It was not easy and it was a cold day with the wind blowing in their faces. For several activities they had to work together to cross moving obstacles (50 feet in the air). My dh & I were on the ground watching. Knowing these children well, we enjoyed observing their relationship dynamics. I heard one child call another a “moron” and I heard another encourage the group to work together. I saw one extend a hand and another back down. But then, I saw trouble. Now this might seem cruel, but parents who spend their afternoons on the school playground know this to be true. As long as you know the company they keep is not likely to inflict any emotional or physical damage, it is best to let the schoolchildren work these things out. We enlightened parents refer to this as the Parents’ Playground Rule (PPR). I listened to the instructor say he was taking my 6-yr old and two others down from the ropes. I decided at this point to walk away and go set up cake to get away. There is something about the power of “mother” that can turn a child to mush faster than a summer’s day does to ice cream. When I returned, my little one had actually pulled herself together, found her inner dangergirl, and crossed the scary “pipe dreams” after all. You Go Girl!! In the end, they all finished with a fun ride down a very long (450 foot) zip line. They all were flying high with confidence! This is proof that the PPR works. I’m incredibly proud of all these kids. I’m especially proud of the youngest — mine — who persevered through her own fears, and came out ten feet tall. And I’m proud we parents didn’t insert ourselves only to muck it up!